The very bathroom door that lives in fear of the swinging Dometic refrigerator door just barely misses the underside of the optional Dometic 11,000 BTU air conditioner. This is a good time to mention that I was quite comfortable, at 6’3” tall, walking around inside the 6’4” interior height of the Bigfoot 25C10.4. That’s probably attributable to (a) the extra inch of headroom, and (b) slouching. I passed under the air conditioner without issue, and stood comfortably in the 6’6” shower (the shower skylight adds considerable headroom). I know some folks assume Bigfoot campers are low inside. That wasn’t our experience with the 25C10.4. 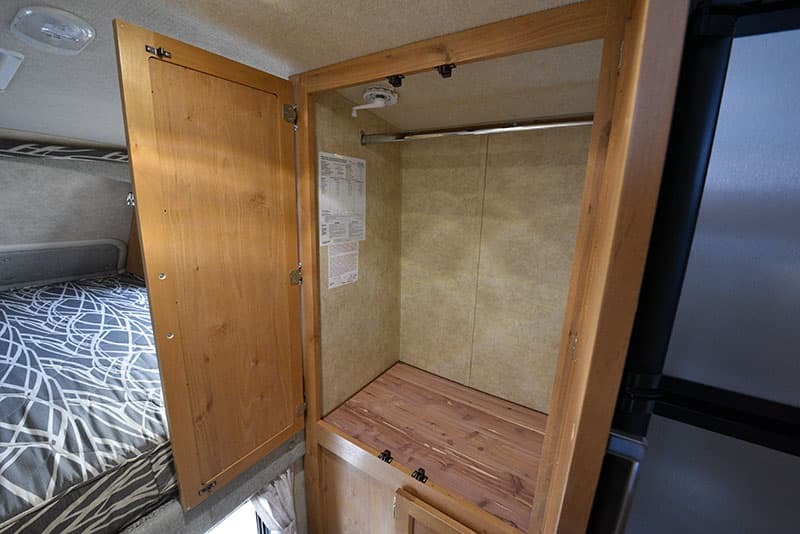 On the passenger’s side across from the shower stall wall is a cedar hanging closet. This is a generously sized closet for hanging shirts, coats, and other hanging clothes. On the closet ceiling is the television antenna crank and directional adjustment dial. The flat panel television mount is located on the opposite side of the wall. With the cabinet door open, it would be difficult to see the television while making directional adjustments. I would prefer to have the television antenna crank in the cabover bedroom area above the television. I’d also like to see a no-crank King Jack antenna considered. It’s too easy to forget to crank an antenna down before leaving and drive around with your antenna up. Under the cedar closet there’s a shallow two shelf cabinet that might be considered a spice rack. There’s even a slight lip to keep items from spilling out. 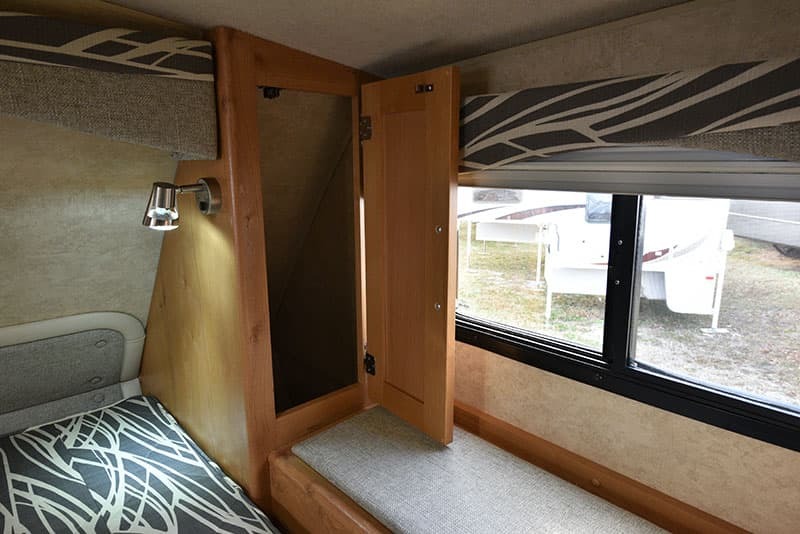 The Bigfoot 25C10.4 bedroom is a bit closed off from the main living area of the camper by the large dry bath and hallway. This gives the 25C10.4 a sense of having multiple separate rooms; like a house. There’s the cabover bedroom, the dry bathroom, and the dinette kitchen room. 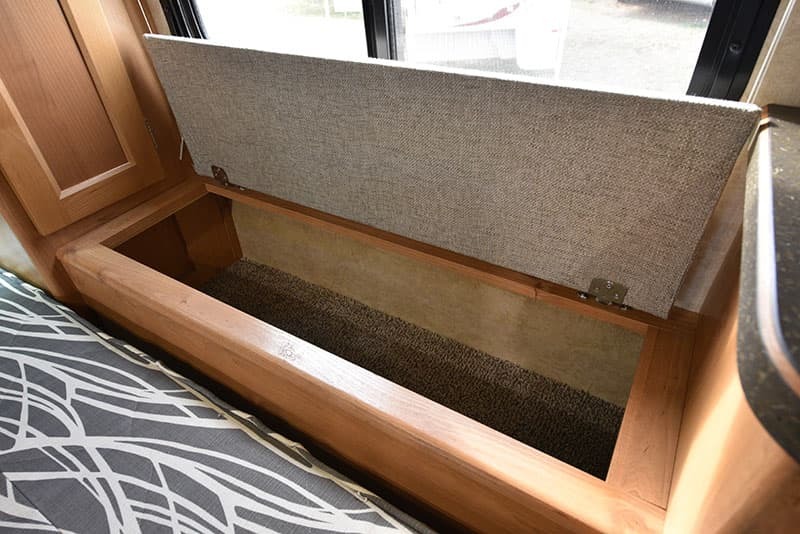 Some folks may not like this sense of separation, but it means one person can be sleeping in the cabover while another works on their laptop in the dinette. There’s just enough space between these two areas that sound and light have a chance to not be intrusive. 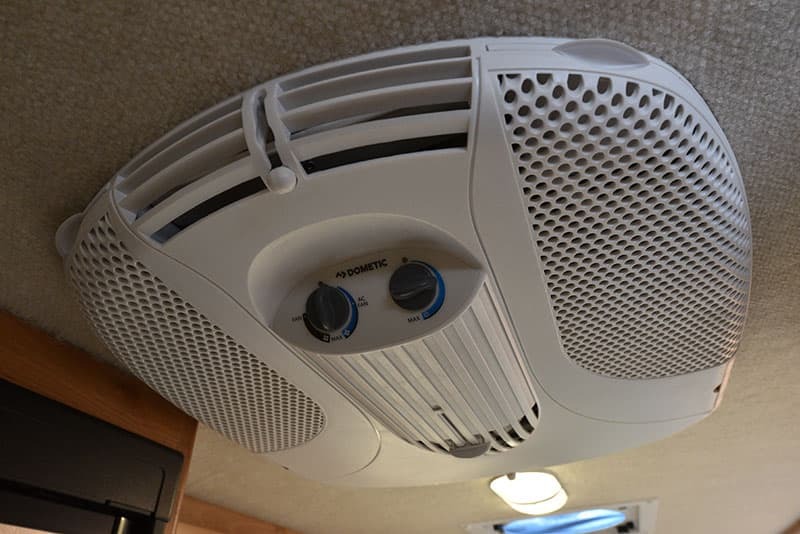 That is a rare thing in a truck camper. The cabover itself is traditionally designed yet modern in its materials and execution. The Canoe Birch cabinetry, stainless steel pulls, and tastefully neutral fabric and wallboard create an inviting aesthetic. The storage is also well balanced on both sides with a hamper, front penguin storage, and bonus storage option on both sides. We have heard from readers who are concerned about the cabover bed length in Bigfoot truck campers. When we measured the bed length in the Bigfoot 25C10.4, it was just under 74-inches (6’2”). 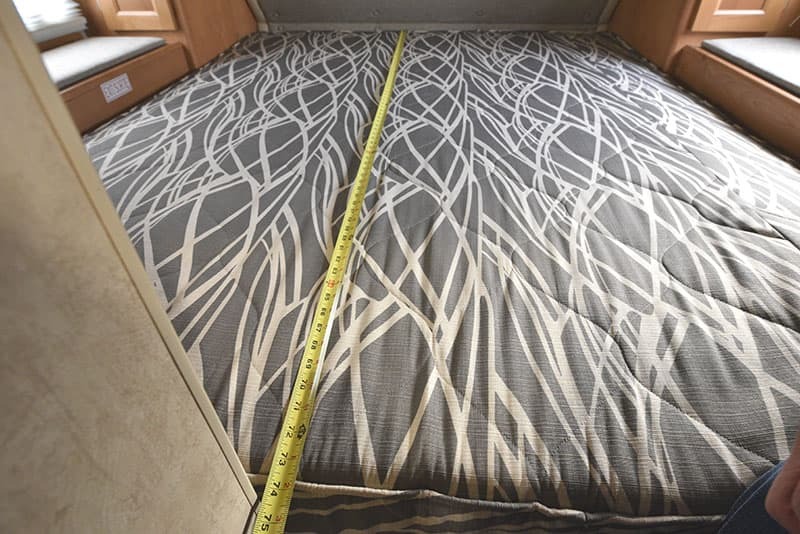 Most truck camper beds are 80-inches long. At 6’3”, my feet would hang off the end of the cabover bed a little – if I fully stretched out. Since I’m a curl-up side sleeper, this would not be as much of an issue for me. However, taller folks who stretch out when they sleep should take note. The bonus storage feature on the driver’s side is a large storage closet. The driver’s side hamper is partially consumed by a ducted heat vent. In theory, this should help to avoid the all too common “warm living area” and “cold cabover” syndrome. I would like to see the vent itself placed somewhere that doesn’t sacrifice valuable hamper space, and potentially get things dropped into it. Both sides of the cabover front nose get penguins, so called because they look like the flightless aquatic birds when stood up on the factory floor. I did not make that up. Penguin cabinets are very useful, but the typically deep floors and awkward space can be very hard to keep organized. To address this, I would love to see these penguins with a mid-shelf and maybe a false floor for upper and lower storage. Now that’s a hamper! This is where most folks keep socks, underwear, belts, and books for nighttime reading. 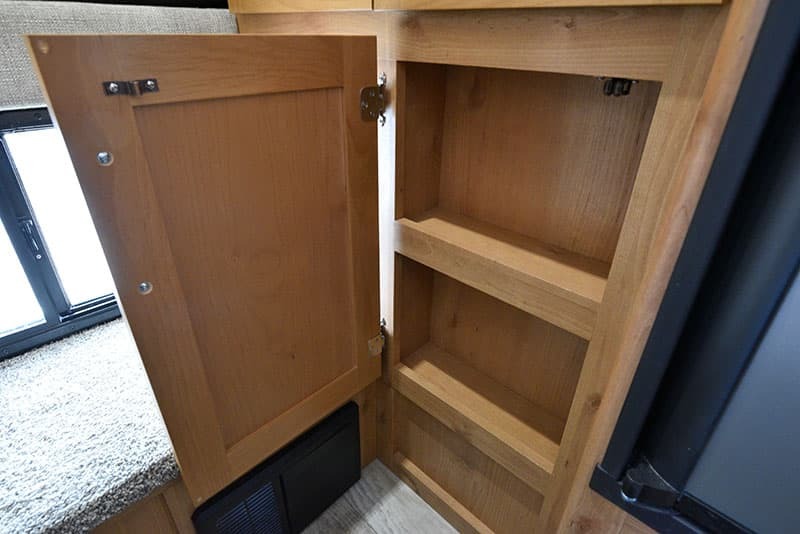 I also want to point out the quality of the cabinetry finish one more time. The fabric covered lid is also nicely finished. 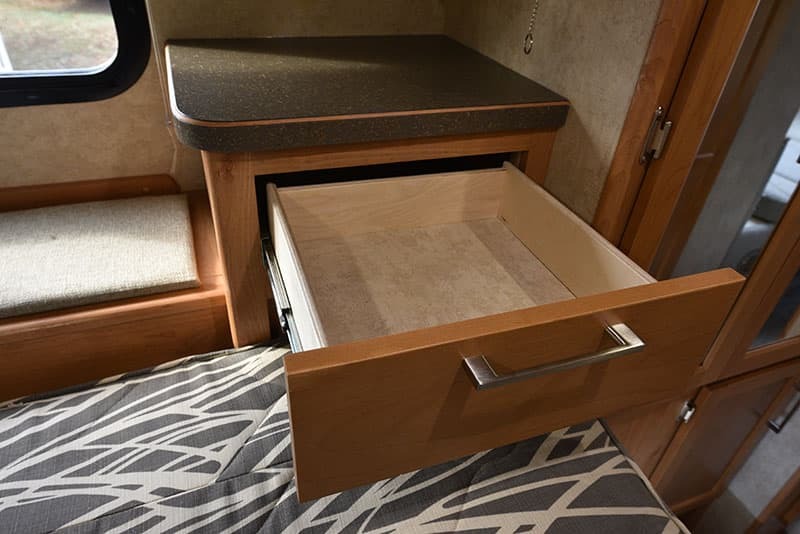 The bonus storage on the passenger’s side is a night table and drawer. I can see the owners putting their smart phones here at night, and maybe a Kindle or iPad. That’s how we roll in 2018, right? 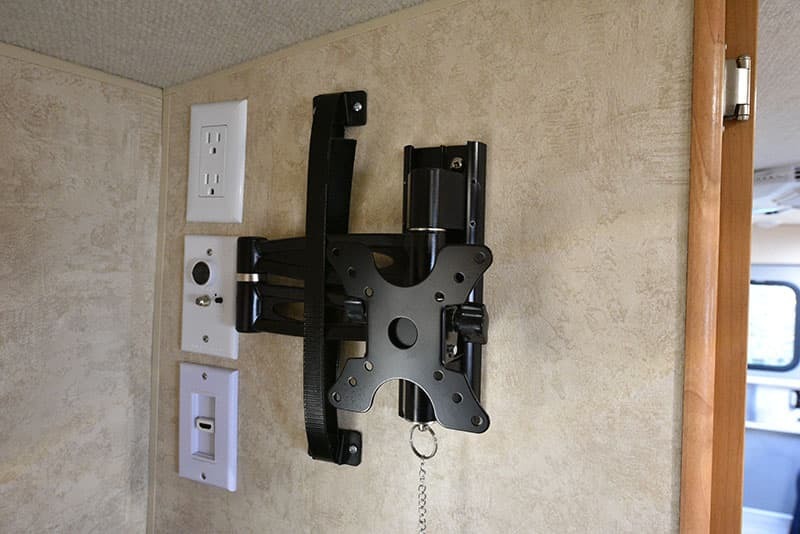 The television mount is designed to accommodate up a 19-inch HDTV. That’s a decent size for a truck camper cabover. You may be able to install a 24-inch television, but please measure first. 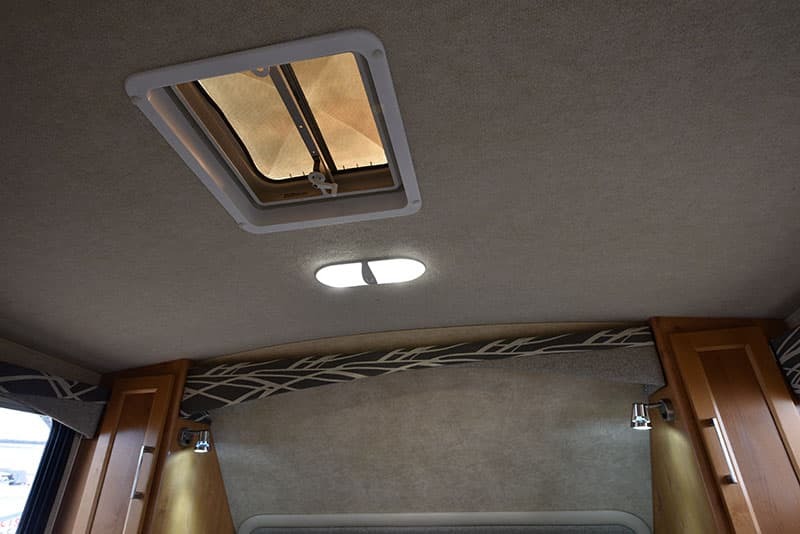 Above the bed in the cabover, most truck camper manufacturers install either an insulated Heki skylight or a Fantastic Fan. In this same spot, Bigfoot has a non-insulated vent. 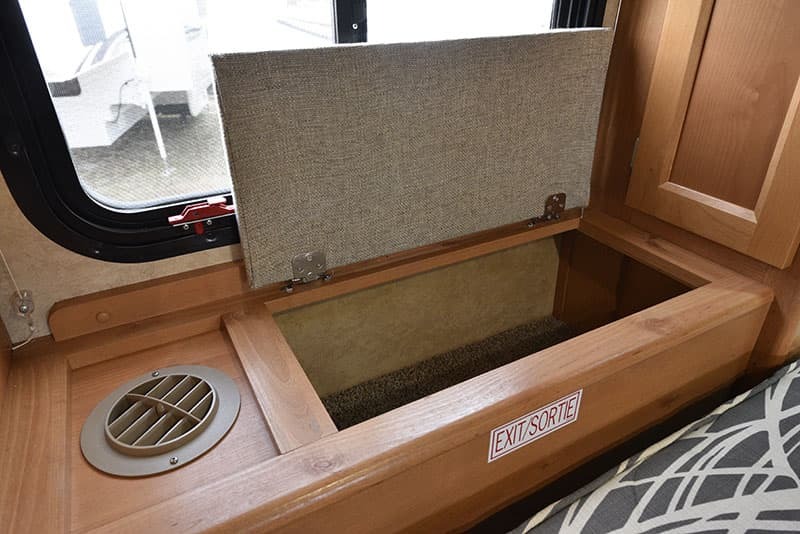 With the Fantastic Fan turned on in the main living area, and the entry door and windows closed, this vent would bring plenty of air through the cabover. That said, most folks would probably prefer the option of a Fantastic Fan in the cabover. Fortunately, that’s an available Bigfoot factory option and should be easy to add after the fact. A&M Services just didn’t order it for this unit. As I wrapped up my review photography, I turned to look back through the camper toward the entry door and looked at the floor. There are many among us who would never consider a non-slide truck camper. Mostly this boils down to the incredible sense of openness slide-outs create by increasing the floor space. What’s lost in this decision is what’s lost. 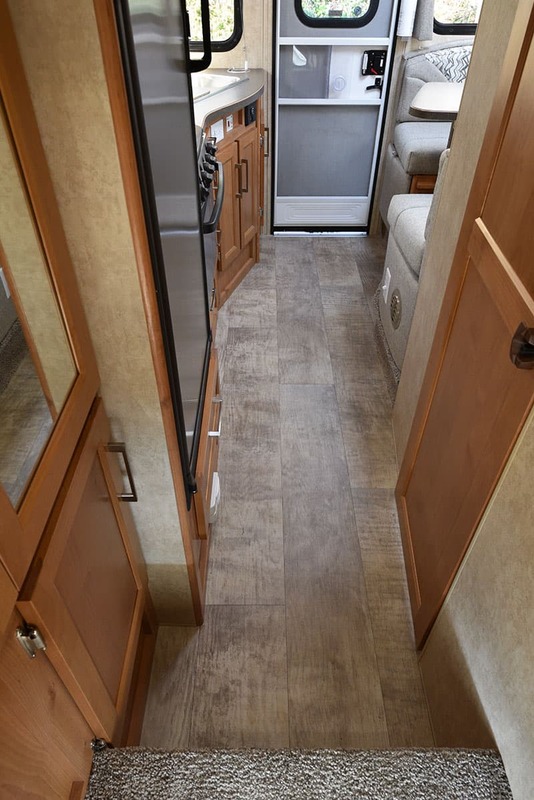 Yes you gain more floor space with a slide-out, but you lose cabinetry, counter top width, dinette width, and other interior features to allow clearance for the slide-out room and mechanism. Then you gain camper weight, mechanical complexity, and maintenance. 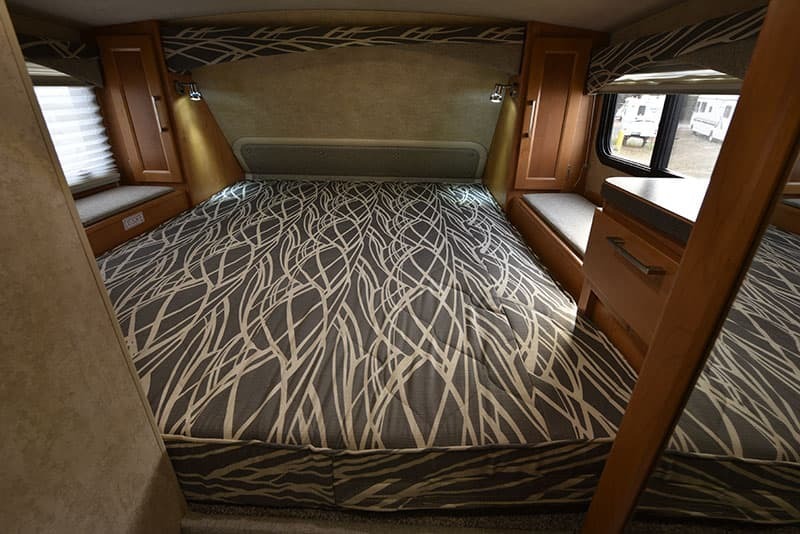 The Bigfoot 25C10.4 is a breathtaking example of what’s possible in a long bed, non-slide design. 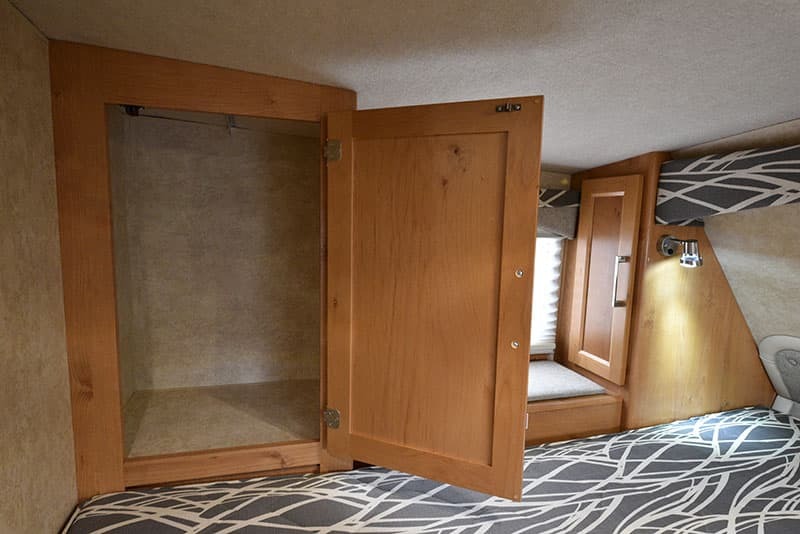 Look at the booth-dinette, fully-featured kitchen, huge dry bath, storage upon storage, and nicely separated cabover. What’s missing? Floor space. And possibly a sofa or reclining chairs. I’m not saying those features aren’t possibly important, but that’s it folks. This is one impressive luxury truck camper.